Tokyo treats our patrons to various specials throughout the week and on special occasions. Stop by any of our Southeast Texas locations to enjoy these discounts on food and beverages on these very special Tokyo Nights! Reverse Happy Hour is always on Mondays at Tokyo Steak House! From 8p. 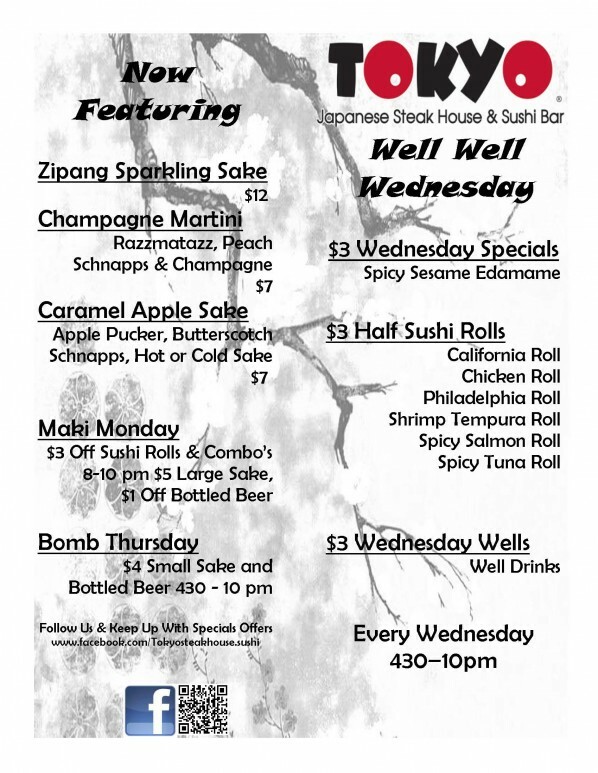 til Close you can enjoy $3 OFF ANY Sushi Roll or Sushi Combo, along with Special Pricing on Beer & Sake! Tokyo is always creating new and tasty off-menu rolls, so be sure to add a few to your order! Southeast Texas comes to Tokyo for Happy Hours that are served from 4:30p until 5:30p Monday through Saturday! Also Monday from 8p until Close!